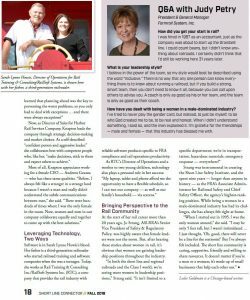 The Fall 2018 ASLRRA Short Line Connector magazine featured outstanding women in rail. Director of Operations, Sarah Lynne Howie was one of the women to be highlighted. A screenshot of her article is attached or you can click here to access the Short Line Connector. Sarah Lynne appears on page 18.